Before we used plastic forks, knives, and spoons, the only option available was metal. As plastic became more and more popular, it began to take over our utensil drawers. Although many utensils are still found in metal, plastic now has many applications in the tableware industry. It also has opened new possibilities. After World War II, plastic was being used more regularly in the home. By the 60’s, plastic had replaced other materials in the kitchen like wood, metal, and glass. Families saw the benefits of plastic tableware. Several companies began to make kitchen products that didn’t break easily, were easy to clean, came in beautiful colors, and at an affordable cost. Companies like Lustro Ware and Melmac began making spoons, scoops, forks, bowls, and other kitchenware with plastic. In fact, modern kitchens that are said to have the “retro” look of the 1960’s are frequently associated with brightly colored plastic. Manufacturers soon began making plastic spoons, forks, and knives that were meant to be thrown away after one use. This eliminated the need to use water, electricity, and manpower to wash them. For this reason, these disposable utensils became very popular with fast food restaurants and airlines. Today, disposable utensils can be found at restaurants as well as on grocery store shelves. Disposable plasticware comes in a variety of styles. The iconic look of plastic forks, knives, and spoons is a solid white color. However, there are many more options to choose from. You can buy other solid colors to match the theme of decorations for a party. They may have different textures or uniquely-shaped handles. For occasions that are semiformal, plasticware is available that resembles metal tableware. It may even come in clear or iridescent colors. Plastic makes many complicated shapes possible. For manufacturers of children’s tableware, this makes it the perfect material to use. Spoons, forks, and knives come in a variety of shapes including their favorite cartoons characters. Plastic tends to be gentler on children’s delicate mouths and more comfortable for them to grip. Combining a spoon and a fork was not a new concept when the spork, a combination of a spoon and fork, was registered with the patent office in the 1970’s. Before that, people used stainless steel and other materials to make the hybrid utensil. 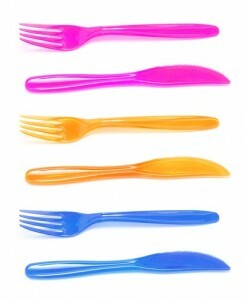 Plastics made sporks quicker and easier to make. There are many benefits of sporks. Prisons use sporks because they are not easily made into weapons by the inmates. Outdoor enthusiast use sporks so they can save space by carrying around only one utensil rather than two. The way the spork combines cutlery to form a new, more useful eating tool has inspired others to do the same. A splayd is a utensil that combines a knife, a fork, and a spoon. When it was first widely used, consumers loved the benefits plastic brought to the kitchen. Plastic makes many things possible for tableware. Pieces can be made that have more complicated designs at a much faster and more profitable rate.